South Los Angeles Parking Lot Becomes an Inner City Wetland by Perrin Drumm of core77. This used to be an MTA bus parking lot and now it's nine acres of wetland! RIVERS... is one of them for me. There was a river in the backyard of the house I grew up in. I would fall asleep at night to the sound of the water rushing over the rocks. The darkness was never really empty for me - it was almost like this energy that flowed like a constant in the background of my childhood. And to me, that sound always connects me to summer with my bedroom window wide open letting the cool evening air in along with the river's lulling sound. Ottawa is great - it has many bike paths close to its two rivers and canal system. When I lived in the U.S., cyclists would always tell me how amazing Ottawa was because of its greenspace and how many paths there were. I love the way the river meanders and affected how the city was built around the waterways. The different seasons by the river are amazing also - I loved biking to work and seeing the baby ducks in the spring and the rabbits everywhere in the summer. After I bought my house, it really hit me that this river is the same river that goes all the way to my parents. I could canoe all the way there if I wanted to. I'm not right by the water - it's about a five-minute walk over but it's incredible to have this type of access and to have it included in so many of my activities (even if it's just crossing the river by bus every day). I take it for granted but thanks to this exercise I'm rediscovering it and want to enjoy it more! This river was my childhood companion and having it so close again is like returning home. During our tracking class last week, the teacher pointed out fresh coyote tracks on school grounds beside the loggersports field. The campus used to be an old farm and there is a river running on the east and south end, with a small creek running into it. Rabbit, skunk, squirrels and racoons live near or on the property. We've also been told that you can find many different birds including osprey, cooper's hawks, ruffed grouse and owls. When you really think about it, it's amazing who our neighbours are. "In the metropolitan core (Vancouver, Burnaby and New Westminster) there are about 200 to 300 coyotes. Coyotes in urban areas will scrounge for food scraps and pet food left outdoors in garbage or compost — but their main food source in cities are the large populations of rats and mice. 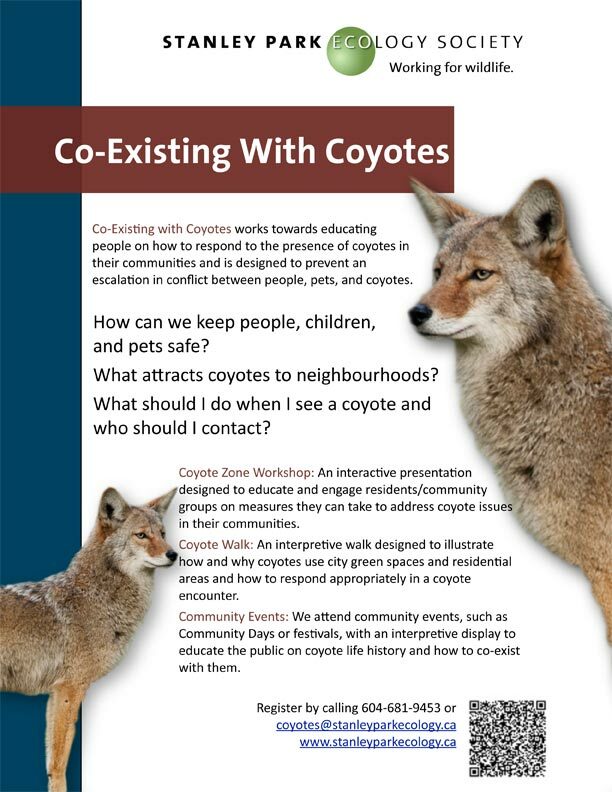 Co-Existing with Coyotes aims to reduce conflict between people, pets and coyotes by providing accessible information through a wide range of media. The program has been developed in cooperation with the Vancouver Park Board and BC's Ministry of Environment in response to increasing public contact with, and demand for information about, coyotes in Vancouver." "The Chaetura pelagica or Chimney Swift is a long distance migrant bird that winters in Peru. In 2006 they were listed as a threatened species, but now, with the help of conservation efforts have returned..."